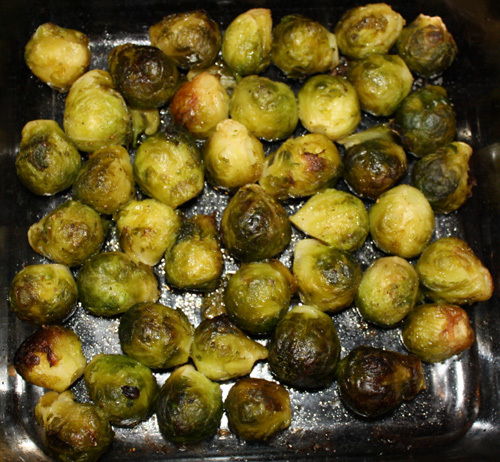 I love brussels sprouts, I cook them at least 3 times a week, but it was not always the case. I grew up thinking brussels sprouts were gross, because they have that reputation, that no one likes them, right? My mom didn’t cook them growing up, and I had never tried them until I was maybe 23. I saw them at the store once in the frozen food section, one of those “veggie and sauce” microwave deals, wanting some variety, I bought them, and tried them, they were alright, nothing to write home about. A few years later I got more into cooking and roasting vegetables. Roasting, the application of high dry heat, carmelizes the sugars in most vegetables vastly improving them. I decided to try roasting some sprouts, and I made a discovery. Brussel sprouts were actually very very very good. Not only are sprouts good, they’re very good for you. They’re a cruciferous vegetable along with broccoli, cauliflower, kale, and cabbage. This family of vegetables are all extremely healthy for you. In addition to the normal vitamins, minerals, fiber, and antioxidants, you find in most vegetables, there are two very special things that these do for you. Apparently, there is a compound within these plants that helps activate the process that flushes toxins from the cells of your body. Cancer is helped by carcinogens that encourage cell mutations, you should avoid such toxins, but in addition to avoiding them you should also ensure that any that make it into your body get expelled as soon as possible. One reason why a high fiber diet helps prevent colon cancer is that, quite frankly, it keeps things moving out quickly. This is the same concept, but on the cellular level. So eating these vegetables help purge your body of toxins. This is real science folks. I know using the phrase “purge your body of toxins” is reminiscent of various snake oil concoctions throughout history, but in this case, it is real hard science, tested and proven in the laboratory. For more on that science see here. But wait, there’s more. There is a compound in cruciferous vegetables that literally encourages cancer cells to commit suicide (apoptosis), making them invaluable for people suffering from that disease. But additionally there is a theory that we actually have cells in our body forming tumors all the time, many many small tumors, that our body naturally kills off, and we develop malignant cancer when our body fails to do this house cleaning. So if that is true, then cruciferous vegetables also help terminate these micro-tumors, preventing malignancy in the first place. So why not make broccoli? Because brussel sprouts taste better? (they do, seriously) However, honestly, I hate cooking broccoli. It is just so fragile. If you undercook it, it is tough, if you overcook it it is bitter, and there is a very short window between the two. Cauliflower is more forgiving, and can be roasted well and used in things like mac ‘n cheese, but it is also the least nutritious of the lot. Both broccoli and cauliflower too I think are best fresh (frozen is not nearly as flavorful in my opinion) which is of course a little more expensive and a little less practical to keep in the house. Then there is cabbage, which I like, and I add it to meatloaf, casseroles, and of course make things like coleslaw a lot in the summer, but it isn’t quite the hot vegetable side you usually want. Brussel sprouts work great frozen, have a huge time window for cooking, and are very nutritious (possibly the most nutritious of the bunch). I’ve actually tried this recipe with fresh sprouts a number of times, and it is never as good as with frozen (I don’t know why, it just isn’t). And, despite rumors to the contrary, it is very hard to overcook a brussel sprout (in the oven anyways). To top it all off, it is easy, it takes me less than a minute of labor to prepare this dish. Cut open a bag of frozen sprouts and empty it into a 9×9 glass baking dish so sprouts form a single layer (use a bigger dish if your bag was bigger than from my store). Sprinkle olive oil over, I use my little oil bottle (you know the kind made for oils that pours it slowly) and make a zig zag from one side to the other and back. Probably 2-3 tablespoons total. Sprinkle with about a teaspoon of kosher salt, I just grab a fat pinch, I don’t measure. Grind a few grinds of fresh black pepper over it. Shake the pan to promote even coverage, then toss it into a cold oven and set the over to 425 and your timer to 30 minutes. After 30 minutes, remove, and stir it. Put it in for at least another 30 minutes, but as I said it is very forgiving, and can go as long as another hour at the high end. You can serve it as is, and I love them, but you can also dress them up with some butter or freshly grated parmigiana cheese. They are sweet, crispy and brown on the outside, soft and savory on the inside, and a little salty. So I eat these at least three times a week, and I recommend you do too. They’re easy, they’re cheap, you can buy a lot and store them in your basement freezer, they taste amazing, and they’re incredibly healthy for you. In the future one day should you meet a Vulcan and should they tell you to “Live long and prosper.” You can answer that you will, because you eat brussel sprouts. I totally agree with you about brussel sprouts. I have never tried them with parmesian cheese before but think I will try it. I am so hooked on those little green things. I will open up a bag of frozen ones (which I personally love better than fresh) and eat them by themselves. Absolutely delicious. So, I found a bag of brussel sprouts in my freezer. They’re from our own garden. My wife said that they’re about 2 years old. Do I dare heat them up and eat them? The next time you roast your sprouts, try adding a tablespoonful or two of balsamic vinegar. I’ve had to modify my diet considerably, due to high blood pressure and a salt sensitivity. I’ve been experimenting with herbs, spices, and many vinegars. Balsamic is my favorite, because of its mellow, slightly sweet flavor–and with Brussels sprouts, you have a marriage made in heaven! Thanks for a recipe that doesn’t required adding maple syrup, honey, balsamic vinegar, molasses, chipotle or any of the other standard flavor fakes to brussel sprouts. Heston Blumenthal has a related way of treating broccoli that you might (big question mark) like; in this recipe, the broccoli is just scorched in the pan. You may add butter if you like.